I’m in St. Augustine for a month. Since it’s a high of -3 in Denver today, I’m feeling pretty good about that right now. But how does one stick to a work routine in a new place with the surf pounding just outside the window? Although there are new and unique distractions, they are actually fewer than the ones at home. No meetings, no coffee or lunch dates, no volunteer gigs, no friends over for dinner. And I’ve come up with a system that seems to be working. First, I set up a workspace, with my MacBook, reference books, spirals, and folders, close at hand. Once I claimed my own place, I felt more in work mode. I brought a large number of books, notebooks, and folders with me and shipped more. Even if I don’t use all of it, I feel better knowing it’s here if I need it. I’ve tried to maintain some kind of routine. In the morning, I do research and reading related to my current project. 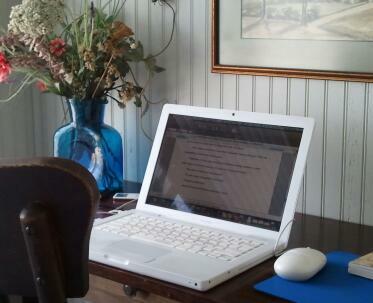 After breakfast, I sit down at the computer and outline, work on characterization, or write. After lunch I take time off to walk on the beach, then I work a bit longer. This afternoon it’s my blog, but other days it’s more research, reading, or writing. The question for me at the end of this stay will be: Would it be better to take a real vacation for a few weeks? Get away from work, period? Is that a more effective way of refilling the well than this part-work-part-vacation experience? Are you able to work away from home and your usual work setting? How have you managed? What are your secrets? Hearing and reading about you fulfilling your dream is more than an inspiration. You are warming many 65 year old hearts, among others. Will follow you on my Nook when I can figure out all this techie stuff. Sure will be nice to catch up. Take care. Sending warm (oh well) hugs! Hi Patty–How nice to hear from you! Thanks for your good wishes. It’s been a long time since my first book set in Asheville…Hope you and yours are well!